The village of LaRose (population 149) is located on the busy Il. Route 89 at County Road 1 in south central Marshall County. The AT & ST Railroad runs just southeast of town. This places LaRose approximately 25 miles northeast of Peoria. There is not a lot of information available to this writer regarding the town and school system of LaRose. 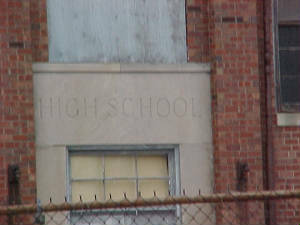 It is known that the high school was still active in 1959. This is evidenced in a 1959 Mineral High School yearbook which has the two schools competing in a basketball game. 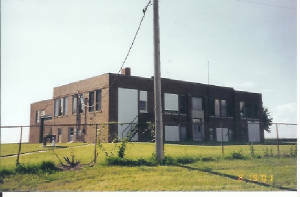 Before the fall of 1961 LaRose High School was deactivated. The school-aged children of LaRose now have their choice of attending school as part of the Lowpoint-Washburn School District, the Minonk Fieldcrest School District, or in nearby Midland School District in Varna. LaRose is technically included in the Fieldcrest School District however. School Fight Song: "Cheers, Cheers for Old LaRose High"
Old LaRose High will win over all. We could not find any information on the IHSA web site regarding the LaRose High School athletic program. 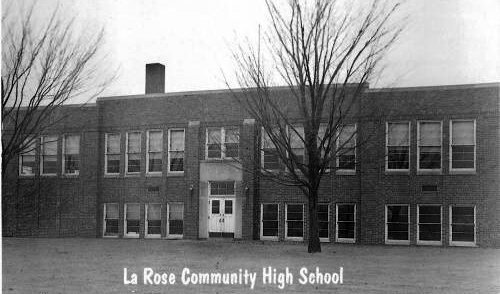 It is believed LaRose competed in the Little Six Conference in the late 1950s which included Hennepin, Magnolia-Swaney, Lostant, Mineral, and possibly Bureau Township HS. This may have been a basketball only conference. LaRose HS probably also offered track and baseball. If you have any information you can share with us regarding the LaRose High School athletic program please read below.